The Sheba Foundation aims to provide home tutoring for up to 30 children in the Jerusalem area each year. 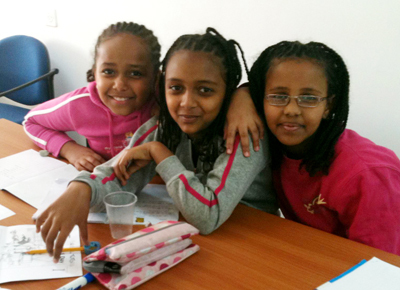 Ethiopian-Israeli tutors assist children who are struggling in school due to lack of resources at home, or low grades. Significant and notable improvements have been achieved in children’s work. Children with scholastic potential are also tutored; a number have been accepted into selective schools for gifted children after tutoring. Vocational training scholarships are given to assist adults gain a trade and employment. Both men and women are assisted. This enables the family to receive more adequate wages in order to provide for their families, and the confidence and success of a professional trade, such as dental assistants; computer programers; dress makers; and bookkeepers. Weekly classes are run for both children and adults, according to levels of enrolment. 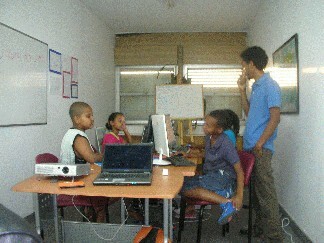 Taught by an Ethiopian Israeli IT expert, sessions inspire motivation as well as practical computer skills. One-time educational assistance is given to needy families to assist with school fees, or for the purchase of school and educational supplies. Many Israelis, including Ethiopian-Israelis, long to improve their English language skills for work purposes or for school requirements. Classes are provided for both children and adults through professional English classes as a service to the community. All that is required by the student is regular attendance and motivation to learn. The Sheba Foundation aims to conduct life skill seminars and self development courses on a regular basis. Topics include budgeting and financial planning; how to write a resume and apply for a job; developing self confidence and leadership skills; family and parenting skills; topics for women. The Sheba Foundation receives many requests for humanitarian aid from needy families throughout Israel. Requests include dental assistance, household appliances, as well as food supplies and basic family needs. Many families struggle to pay utility bills and general living costs. It is often not just the amount, but the knowledge that someone cares and can give hope. The Sheba Foundation recognizes the importance of preserving the rich Ethiopian culture that enhances multi-cultural Israeli society. 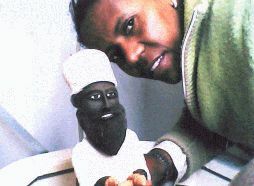 Support is given to sculptors, painters, and weavers. The Foundation sells original paintings by artist, Berihun Moges (see information below) of Biblical and Ethiopian cultural scenes, including pictures of the historical exodus from Ethiopia through Sudan during Operation Moses. Please contact the Foundation for more information. Berihun Moges was born in the city of Gondar in Ethiopia in 1940. He studied to become a teacher and worked as such in Gondar for the period of four years. During his youth he discovered his passion for painting and has continued painting till today. Our projects offer you opportunity for involvement. I invite you to link hands with the Sheba Foundation through financial partnership. The aim of our projects is to equip the Ethiopian Jewish community to rise to a new level of success and hope within modern Israeli society. With your help, this miracle is possible.